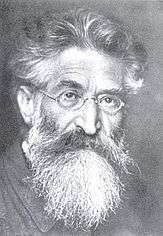 Fritz Mauthner (22 November 1849 – 29 June 1923) was an Austro-Hungarian novelist, theatre critic, satirist, and exponent of philosophical skepticism derived from a critique of human knowledge. Mauthner was born on 22 November 1849 into an assimilated, well-to-do Jewish family from Horschitz (Hořice; also Horschitz) in Bohemia. He became editor of the Berliner Tageblatt in 1895, but is best known for his Beiträge zu einer Kritik der Sprache (Contributions to a Critique of Language), published in three parts in 1901 and 1902. Ludwig Wittgenstein took several of his ideas from Mauthner, and acknowledges him in his Tractatus Logico-Philosophicus (1922). Beiträge zu einer Kritik der Sprache, three volumes, Stuttgart: J.G. Cotta, 1901–1903. Selbstbiographie 1922, in: Philosophie der Gegenwart in Selbstdarstellungen, Bd. 3. ↑ Iggers, Wilma. "Mauthner, Fritz". The YIVO Encyclopedia of Jews in Eastern Europe. Retrieved 2013-10-05. ↑ Nájera, Elena. "Wittgenstein versus Mauthner: Two critiques of language, two mysticisms". From the ALWS archives: A selection of papers from the International Wittgenstein Symposia in Kirchberg am Wechsel. Retrieved 19 December 2014. ↑ Janik, Allan and Toulmin, Stephen Toulmin. Wittgenstein's Vienna. I.R. Dee, 1996 (first published 1973), pp. 119, 121–133. ↑ Wittgenstein L., Tractatus Logico-Philosophicus, "4.0031 All philosophy is a 'critique of language' (though not in Mauthner's sense)." Arens, Katherine. Empire in decline: Fritz Mauthner's critique of Wilhelminian Germany. New York: P. Lang, 2001. Ben-Zvi, Linda. Samuel Beckett, Fritz Mauthner and the Limits of Language. PMLA. Vol. 95(2): 183-200. 1980. Bredeck, Elizabeth. Metaphors of Knowledge: Language and Thought in Mauthner's Critique. Wayne State University Press, 1992. Knowlson, James & Pilling, John. Frescoes of the skull. London: John Calder, 1979. Kühn, Joachim. Gescheiterte Sprachkritik: Fritz Mauthners Leben und Werk. Walter de Gruyter, 1979. Ludwig, Otto & Heydrich, Moritz. Shakespeare-Studien. Halle: H. Gesenius, 1901. Skerl, Jennie. Fritz Mauthner's "Critique of Language" in Samuel Beckett's "Watt". Contemporary Literature. Vol. 15(4): 474-487. University of Wisconsin Press, 1974. Vierhufe, Almut. Parody and Language Critique. Studies on Fritz Mauthner's Nach berühmten Mustern. Niemeyer, 1999. Weiler, Gershon. Mauthner's Critique of Language. Cambridge University Press, 1970.